Bradley E. Haddock, 64, loving husband, father, grandfather, and friend, met his Savior Jesus face-to-face on April 1, 2019, when his weary body succumbed to complications of AL Amyloidosis and Multiple Myeloma. A celebration of his life will be held at 1:30 p.m., Friday, April 12, 2019, at First Evangelical Free Church, 1825 N. Woodlawn, Wichita, Kansas. Brad is survived by his wife, Terri; children Austin Haddock of Wichita, and Sarah and her husband Gerard Pryor of St. Marys, KS; grandchildren William and Edward Pryor; brothers Richard (Amanda) Haddock of Wichita and David Haddock of Franklin, TN. He was born in Wichita on Jan. 4, 1955, to Kenneth and Genevieve Haddock, both who have preceded him in death. Active in Boy Scouts, sports, music, and his church, he grew up with a strong foundation of what it meant to care for and serve others as Jesus Christ did. Nowhere was this more evident than in his career as an attorney, in his service in Scouting and church, and in his care and love of his family and friends. Brad met Terri Hannon at the Bicentennial Meeting of the Boy Scouts of America in New York City in May 1976. They were both Kansas kids who had been selected to receive the BSA Young American Award. The romance continued back in his hometown of Wichita, where she attended Wichita State. They were married Jan. 7, 1978, while he was still in law school, earning Terri her “PHT” (Putting Hubby Through) degree. To his children, he was a great dad! He was thrilled beyond belief when Austin and Sarah each asked Jesus to be their Savior as little children and was a role model of following Christ. They saw the country traveling to national Scouting events, meeting wonderful people everywhere! He was a proud father as Austin achieved the rank of Eagle Scout and Sarah spent five summers on Philmont Scout Ranch staff. He modeled his faith and values in his life every day for his children who are carrying on his legacy in their own lives! One of Brad’s greatest joys was being called “Grandpa Brad” by his grandsons, “Master” William and “Master” Edward. Brad graduated from Wichita Heights High School in 1973, from Phillips University in 1977, and from Washburn School of Law in 1980. He was Executive Editor of the Washburn Law Journal, recognized with the Phillips University Distinguished Young Alumnus Award, and named a Washburn School of Law Alumni Fellow. Prior to founding Haddock Law Office, he worked as an attorney at Koch Industries for 29+ years, serving most of those years as Vice President and General Counsel of the Koch Chemical Technology Group. He achieved the Martindale-Hubble AV Preeminent Rating which recognized those with the “Highest Possible Rating in Both Legal Ability & Ethical Standards” and was a mediator with both the American Arbitration Assoc. and the International Centre for Dispute Resolutions. Brad joined Scouting as an eight-year-old Cub Scout with his service ending as BSA National Committee member, Chairman of Scouting U, and Quivira Council Executive Board member. 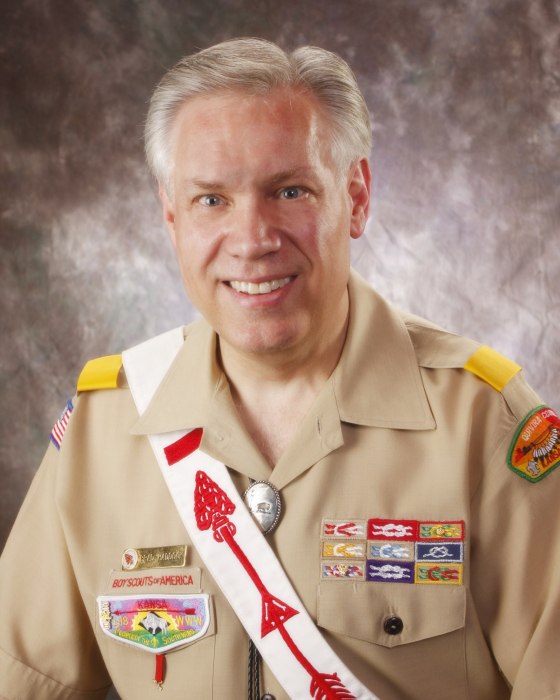 During those 56 years, he was continuously involved in Scouting locally and nationally, especially in the Order of the Arrow, the BSA’s honor society, serving as OA National Chief as a youth and as Chairman of the National OA Committee as an adult. An Eagle Scout and OA Vigil Honor member, he was recognized with Scouting’s highest volunteer honor, the Silver Buffalo Award, and with the OA Legacy of Servant Leadership Lifetime Achievement Award. His real accomplishment is the impact he had on the lives of countless youth and adults, always modeling the Scout Oath and Law in his daily life. In addition to Scouting, Brad was active in community service, having served as Chairman of the Chamber’s Leadership 2000 and as a Board of Trustee member for Friends University. He accepted Jesus Christ as his Lord and Savior as a child and lived as one who loved God and wanted others to know about his grace and truth. He was a member of GraceFirst Church, serving most recently as an Elder. He always challenged everyone with the phrase, “Armor on?” reminding believers to daily put on the full armor of God (Ephesians 6). While it did not define his life, he lived the last 9+ years with the rare disorder AL Amyloidosis, which primarily affected his heart. He endured a stem cell transplant, years of chemotherapy, and other treatments as he walked with God, sharing comfort and support with others facing challenges in their lives. Two years ago, he also was diagnosed with Multiple Myeloma, yet he bravely kept on ministering to others and trusting God for one more day. He was especially passionate about educating every healthcare giver he met about signs of the little-known disease amyloid. The story of his diagnosis and first days of treatment have God’s fingerprints all over them. His family and friends saw him as a great man, but he saw himself as a man serving a great God. In lieu of flowers, memorials have been established with Quivira Council Boy Scouts of America, the National Order of the Arrow Endowment Fund, and GraceFirst Church.